This post was inspired by my (at the writing of this) 10yr old son. I wrote this post several months ago and for some reason never hit publish. Since then I got offtrack with all that I wrote here. Today I rediscovered this post …at a time when I really needed to remember what I had written here, and rededicate myself to my quest to change my life in this way. I am publishing it now to remind myself of all this post contains and how important it is to me…and in the hopes that it might help others as well. I really needed to read this today, when I’ve been spinning out of control for weeks, months, and at all time lows, deep in the throes of perimenopausal hormones and fighting to learn how to work with, not against, my ADHD self. If this post rings true to you as well, I would love to hear about it in the comments. I don’t remember what started the conversation, but the subject of multitasking came up in the car recently and my son started quoting me the facts he learned in an episode of Nova ScienceNOW (a favorite show in this house…), where they talked about how multitasking is bad for your brain. My 10yr old son really made me think about my multitasking and how it’s affected not just my life, but his. I’ve been doing a LOT of thinking lately about my life and how I feel about it. 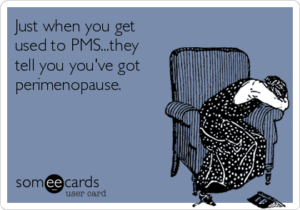 At 45 and a half years of age, I’m in the throes of perimenopause and all the hormones and emotional roller coaster that entails, which has caused a lot of self reflection…How I feel about my life, my stress level, my busyness factor, my inability to follow through on any sort of regular daily routine (a lifelong problem), and ESPECIALLY: the multitasking ridiculousness of my life due to my drive to always be accomplishing something because of that NEVER.ENDING.TO DO LIST!! Not long ago I finally started to really face what some things are doing to my life. So I took the Facebook and Facebook Groups apps off my phone (to stop the constant compulsion to check my feed and the inevitable distractions that causes), and I’ve started making a conscious effort to cut back significantly on much of my multitasking, and instead FOCUS on tasks and people, ONE.AT.A.TIME. At least, as much as possible…and for the most important stuff. There is, of course, some multitasking that is relatively harmless. Listening to a podcast while doing dishes, for example….Or watching tv while folding clean clothes….some things just don’t need you to really focus. But a lot of things are done significantly better when my attention isn’t divided, I’m learning. And PEOPLE, deserve undivided attention. I’m only just beginning, so I’ve not gotten very far yet. Babysteps. But I can already feel a difference. The removal of Facebook from my phone alone has been HUGE. The rest is going to have to be slowly, but surely. It’s a tough habit to break. I don’t even realize I’m doing it half the time. But I DEFINITELY was feeling it. I just didn’t realize what it was until now. That constant NEED to be doing something, but then never really feeling accomplished, never really feeling like I am successful…always feeling like a failure because my to-do list never seems to get smaller and the things I try to accomplish never feel up to par. Now I know why. Because they CAN’T be up to par, when I’m dividing myself to the level I was. And on some level I guess I knew this, because I haven’t been able to feel truly happy. Sure, moments of it…but in general, overall with my life…that constant low level unsatisfactory feeling like I am reaching reaching reaching and just NOT getting it! And I thought the solution was to TRY HARDER. WORK HARDER. I have started to realize the cost of the frenetic life. I’m starting to realize that the solution isn’t to work harder, but to SLOW DOWN. So I’ve started forcing myself to sit and reflect and journal again each morning, like I used to always do, prior to motherhood. Back when my life was less chaotic. Back when life was slower. (Although I didn’t realize it at the time.) Because this was always a very meaningful thing for me…and I had forgotten it’s impact on my life. The importance of quiet time to sit and reflect and JUST BE, cannot be overstated. I am finally realizing how huge an impact it’s had on my life…my neglecting this for so long. My emotional life has been less than fulfilled for some time, (due to my never ending quest to be successful at all things, yet sabotaging myself every step of the way with bad habits like multitasking)…but with the onset of the emotions of perimenopause, I’m reaching a critical junction in my life where something has to give. And I’ve finally realized that it’s time to make some major changes. I’ve always rejected the insane pace that is the norm in our culture these days. I have never had my kids involved in a multitude of activities, driving them to and from events on a daily basis with little time for anything else…nor have I had myself involved in organizations or groups that involve tons of meetings and activities on a regular basis that would keep our lives so full that we constantly have no time to be home or spend time with friends and family. I have absolutely refused to live that life. It is part of the reason that I homeschool, to keep that madness from my children’s lives…that work schedule that the public school forces on the children, overloading them with homework and the culture to fill their after-school time with extra-curricular activities. But I’ve since learned that it’s not just the public schoolers living this way, as I do still see this same crazy over-filled schedule in many homeschool families. It’s our country’s modern culture. You see articles on the web daily about how childhood is gone, children are no longer allowed down time, and free play and boredom (both extremely valuable things) have been practically eradicated in our modern society. I’ve prided myself in not allowing this lifestyle into my children’s childhood. And yet…I’ve somehow allowed my own daily life to be equally as stretched through multitasking. We all do it. Women are renowned for our excellent multitasking abilities. We pride ourselves on it!! We see it as a badge of honor, we brag about our abilities! But I have long been reading here and there about how multitasking is not necessarily a good thing…I’ve been reading that when you do many things at the same time, you do none of them well. Oh you may THINK you are, but you are kidding yourself. Recently this has been coming up again and again for me because this is a huge topic in the business podcasts and Periscopes I listen to and watch. Multitasking is a big no-no if you want to make it big in business. You HAVE to focus HARD if you want to get anywhere in business. You need to CONCENTRATE your energy at the task at hand and give it your UNDIVIDED ATTENTION so that you are doing your BEST. Otherwise, you are just doing half-assed work. HO.LY. CRAP. 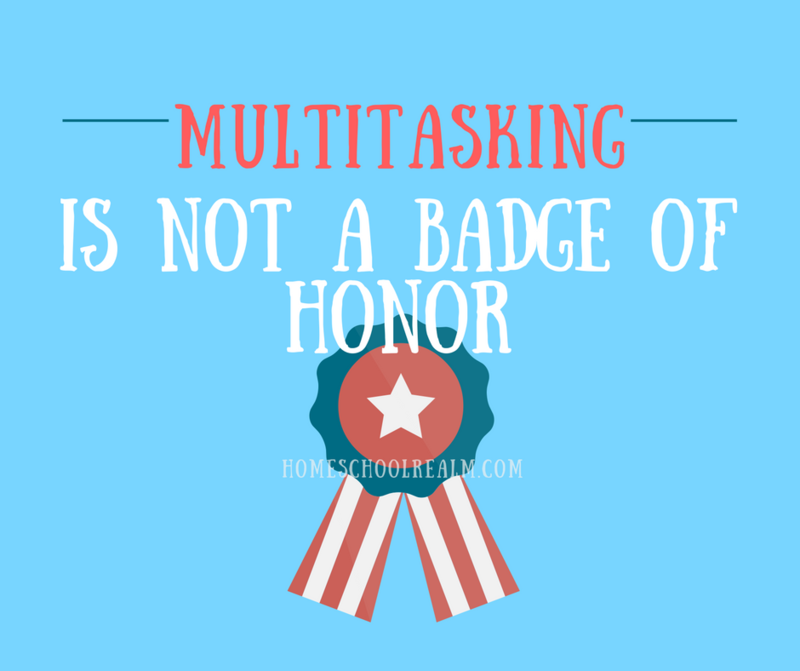 If this is what they say about multitasking while working with writing articles for a blog post or social media or working on creating content for a product…WHAT DOES THAT SAY ABOUT MULTITASKING WHILE RAISING A HUMAN BEING???? HOW CRAPPY HAVE I BEEN DOING THINGS AS A MOM??? All these years….multitasking my mothering….my homeschooling….only half-assing it, only giving partial attention to my children most of the time, as I’m constantly busy with all these THINGS I am constantly trying to get done…which are constantly pulling my attention away from them! I’m not suggesting that we should devote 100% attention to our children 100% of the time. That’s simply impossible, and we do deserve our own time. But I’ve long read about the value of setting aside focus time for separate things. Time for the kids, time for the work, time for the projects in your life, etc. I am starting to see the value in this. Today my husband forwarded me this article. This article is very eye-opening. No WONDER I was feeling drained all the time, constantly feeling compelled to check my Facebook feed all the time and being pulled into article after article, and thread after thread….constantly being distracted. And NO WONDER I’m never able to maintain any sort of a routine with those distractions constantly! 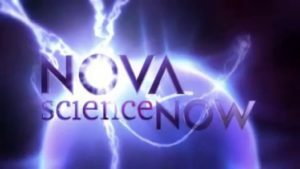 And here’s that video of Nova SciencNOW that addresses this issue again, in case you missed it above. It’s really an excellent and eye opening segment, I highly recommend checking it out. I have the link set to start right at the multitasking part of the show. “They put students through a battery of tests designed to measure their cognitive capacities when not multitasking. What they found, Nass says, was shocking. It’s like a drug! I totally have been feeling that. And breaking that cycle is hard. So….the little changes I’ve made….I’m already feeling in big ways…. Since I took the Facebook apps off my phone, I do still plug in to Facebook via my laptop, but I’m much less compelled to sit at my laptop all day. It doesn’t pull me in like my iPhone does. And now I feel much more motivated to get things done daily around my house when I don’t have those apps pulling me in from my pocket every minute of every day. I’ve already felt more at peace. Not just from the slowing down, but also, because there’s been SO MUCH negativity on Facebook lately, especially in the news. So I’m not being bombarded so much by it. PHEW. In fact, I’m finding that now that I’ve had a break from it…I don’t WANT to plug back into Facebook very often. I’m even going most of the day some days without checking it…I suspect I may get to the point of going days without it even. I’m not anti-Facebook, though. I do see the value in it, and will not completely unplug from it. But I feel like I’m on the right track here. This is a much better way for me personally to interact with it. And … I’m getting much more done around my house and with my kids! And…where I used to start my day lost down the rabbit hole of my Facebook feed…checking back all through the day while trying to accomplish other things (and getting lost down the hole again, inevitably)….now I’m sitting and journaling and having quiet time in the morning to reflect on my feelings…and it is making a change in my emotions as well. Instead of getting caught up in the waves of emotions that all the news on my Facebook feed and dramatic threads in Facebook groups pull me into….I am now getting control of my emotions and how my day goes by making a conscious effort to limit my time on Facebook and focus on tasks at hand, instead of constantly dividing myself. And instead I am working through MY emotions and life in my journal, and having a time of peace to reflect and sit and just BE. Which always benefited me greatly, years ago when this used to be my regular routine. I don’t know why it’s taken me so long to remember this. Another thing that I’ve recently unplugged from is podcasts/audiobooks. I had this serious compulsion to multitask by plugging in podcasts or audiobooks while I work around the house, so I could feel I was getting MORE DONE. Always with sound pumped into my ears. Never time to just think. I have stopped doing this as well. And it’s really weird, going back to being alone with my thoughts instead of trying to get through more podcasts at 1.5x speeds, so I can cover more business info and learn how to further my biz. Or learn something educational to share with my kids. I’ve realized that there is great value in being alone with my thoughts. And maybe the podcasts can be saved for other times…for a focused, allotted podcast listening time…but for now, I need the quiet, thinking time more. I’ve really missed that. I hadn’t realized how extremely valuable that time was to me until now. And finally I have had my lightbulb moment that it is time to make this change to our lives, to our homeschooling, to our home. It’s time for me to lead by example and teach my children how to focus on the task at hand, to unplug from everything else and FOCUS. On tasks, but especially on PEOPLE. Because plugging my earbuds in to listen to a podcast at every available moment so I don’t miss any opportunity to learn another biz tip….or watching videos on my phone all the time….or having the tv on all the time….or constantly browsing through my Facebook feed or chatting with friends…or sitting at my laptop constantly….that doesn’t teach my kids how to prioritize or how to focus and get things done. And it certainly doesn’t make them feel how important they are. And in this crazy information age, with things coming at you from all directions ALL.THE.TIME…people skills and the skill to focus on tasks at hand are things they really need to learn. And the first step is to model it. And just about every single person we come in contact with in our lives these days is certainly not modeling it….face in screens, 24/7 multitasking…..No, that’s my job. They learn the most from me, the mom who is home with them and teaching them every day about all the academic things that they need to learn….and life lessons are part of their learning. This is important.